OFA DM DNA TEST for German Shepherds: Fact or Fiction? If your German Shepherd has been found to have Degenerative Myelopathy upon necropsy, and the dog received a clear or carrier status on the OFA DM DNA test or if the progeny of such breedings test as carrier or at risk please enter your dog's information (click on the headline to go to the page). Site description: Home of the Degenerative Myelopathy Support Group: (Degenerative Myelopathy is the canine equivalent of Multiple Sclerosis). This site includes warning signs of the disease, tests, treatment program, message boards, links for items ill pets will need, indoor pools for dogs, directions for joining our DM newsgroup, articles I have written entitled "Two Hearts: Our Battle with Degenerative Myelopathy", "Two Hearts: The Final Chapter", and of course, photos to make you laugh and think... 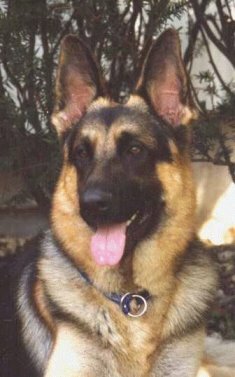 Built with love and determination, this site is dedicated to my German Shepherd Dog soulmate, Jack Flash, who I lost to Degenerative Myelopathy in August of 1998. It is my goal to present a site which is both educational and heartwarming. Hopefully, this site will alert people to the early warning signs of this dreaded disease in the only source of totally unconditional love in the world - the love we get from our pets. Additionally, it is my intention to create a *safe* haven for people to turn to, when they find their dogs have been diagnosed with this debilitating and fatal disease. Through information gleaned from my site, people will learn how they can help their ill fur friends live longer, quality lives. I promised Jack Flash, as he was closing his eyes for the last time, I would help smooth the way for others who have to walk the path we had to travel. It is my intention to keep that promise, until the day a cure is found for this insidious disease. I will not rest, until the disease that took him from me, is also permanently laid to rest.. If you have a German Shepherd dog that has passed on, then please visit Heaven's Gate a database created to further research in determining the cause of death in the German Shepherd dog. This database was created in December of 2003. If you entered information prior to this date, please re-enter your information, as the database is now more comprehensive, and previous entries have been removed. The GSDBBR is open to all owners of Registered German Shepherd Dogs, worldwide, that have titled dogs or dogs within 5 generations of their dog's pedigree that are progeny/ littermates of these titled dogs. German Shepherd Dogs entered upon this database must comply with their country's breed standard. * This registry will house information pertaining to German Shepherd Dogs, both alive and deceased. You may only post information about a dog you own! This Registry has been created in an attempt to gather comprehensive health information which will enable breeders to make more informed breeding choices and to avoid doubling up on health issues. Display our BANNER on your page(s) to link back to our site! Do you have difficulty viewing these web pages in English? Use our Web Page Translator to view the pages in other languages! ¡Use nuestro Traductor de Página de Telaraña al panorama las páginas en otros idiomas! Utiliser notre le Traducteur de Page de Toile à la vue les pages dans les autres langues! Benutzen Sie Gewebe Seitenübersetzer unseres zu Blick die Seiten in anderen Sprachen! Usare il nostro il Traduttore di Pagina di Tela alla veduta le pagine nelle altre lingue! Bruk vår vevsideOversetter til sikt sidene i andre språk! Use nosso Tradutor de Página de Teia a vista as páginas em outras linguagens! © Copyright 1999 - 2018, All rights reserved. © Marjorie Zimmerman © Original Author © Original Photographer. This site is copyrighted including the name "DM Support Group". Additionally, the use of the name "DM SUPPORT GROUP" will not be tolerated. Copying any material or photographs for personal, commercial, internet or other use or publication anywhere else is specifically prohibited. Permission to quote one or two sentences for purposes of review is granted where full credits and URL are cited and notification of same given to Marjorie Zimmerman. This is a not for profit website. This site is a support group for people who have dogs that are ill with Degenerative Myelopathy, and is provided to educate people in relation to Degenerative Myelopathy. We do not collect funds. I am not a veterinarian. Material on this site is provided for informational purposes, only, as a convenience for people with DM dogs, and for those who wish to learn about DM. Do not administer anything mentioned on this site, unless you first discuss the treatment program with your veterinarian! Thanks to Tom Cammarata for original web design.